The Last Leaf Gardener: "Guide us to Thy Perfect Light . . . "
The other day I came across this card that I received several years ago depicting The Three Kings (or Wise-Men) speaking on cell phones as they rode their camels to Bethlehem. Since I wrote about The Three King's celebrating Epiphany last week on their feast day (January the Sixth), I do not think it is too late to follow up on that post with today's blog entry, and a very short thought: The Three Kings on cell-phones! I hope they had GPS and an ipad too! 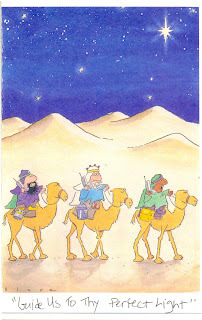 Three Kings on cell phone...Very funny. Yes, how about GPS?